It seems that a lot of efforts and sacrifices are needed for the divided people and unification. When viewing the unification issue of Koreas in objective views, there are not always bright hopes and vision. What can we do for the unification of our people? There are various variables, and various estimation and ways might be estimated depend in gon the international situation and relation between Koreas. The unification of Koreas cannot be easily achieved under any situation by means of only one nation, and it is recognized that the reverse development from the international environment should not be done. What the strategy of the unification of the diplomacy of Koreas might be expanded toward the East North and worldwide range beyond Koreas means that the stability of Koreas and East north Asia might be barometer directly affecting the security of unified Korea. On the four-party conference along with the United States and China who are to play key roles in the unification of Koreas, a policy collaboration between the United States and Korea works well, but China keeps a mediation stance between Korea, the United States and North Korea while preventing any influence from the United States, so it seems that China uses the conference as a change for expanding the influence with respect to Koreas. China and Japan keep a posture of maximizing the nation's benefits rather than building a peace system by attending the discussion on unification. Korea has set a diplomatic tie with China even in the cold war era, but North Korea has maintained a long time blood relationship with China. In this matter, it seems that Korea has not done any key role for maximizing the nation's benefit in view of the intermediate position. As North Korea's system is to be corrupted soon, there is a serious concern on the future and existence of the North Korea's system, so the possibility on the unification grows. Nevertheless a lot of people are reluctance to discuss on the unification worrying on a high unification cost, and worries about the world-class leadership with respect to the side effect occurred in the course of the unification of Germany. In addition, there are a lot of worries and fears about the unclear future on the unification. However the unification that we all necessarily prepare and achieve for the prosperity and bright future of Koreas should be prepared in positive manner. 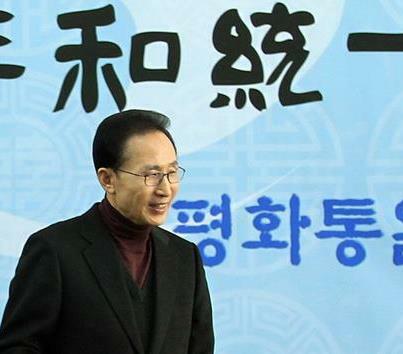 In particular, it seems that the international cooperation posture of the president Lee Myung-bak who continues to emphasize a combination of the international cooperation and Koreas' cooperation as one policy should be considered based on the special situation between Koreas while respecting the universal standard and value of the international society. Namely, it is possible to promote the change of North Korea and to further develop the relationship between Koreas. Although the MD government emphasizes the change of North Korea compared to Rho's government, it is hard to expect a high level development between Koreas unless there is a basic change in the system of North Korea. Namely, the international effort represents a change of North Korea and a development of Koreas and a Korea's diplomatic effort for achieving the peace unification. Such efforts might be a result of the diplomatic behavior with respect to the unification appropriateness for obtaining the supports with respect to the policy toward North Korea of Korean government and the Korea's unification policy. So, a stable infrastructure is needed for effectively propelling the unification diplomacy. As the recognition on the unification benefit along with the agreement with respect to the unification appropriateness is embodied, a dynamic and executable desire for unification is needed. Although the separation and unification are intended to be discussed only based on the cost and benefit for supporting the above confidence, it is impossible to recognize the physical and visible matters that the unification brings us as compared to the political, economical, social-cultural damages due to the separation. Since the cost for separation can be compensated at the time of unification, it seems that the removal of the cost for separation might bring us the direct benefit from the unification. If the unification is made, a sudden unification can be more beneficial as compared to a slow and gradual unification. The neighboring counties such as China, Japan and Russia might change their diplomatic concepts while considering a load with respect to Koreas for the reasons that the territory expands with the help of unification, and the population increases, but it does not mean the increase of economy. Namely, it seems that the unification between Koreas does not largely affect the neighboring countries with respect to the definition of the divided countries or the unified Koreas only with the influences against the world economy facing Korea in recent years. In case of China, although 20 years have passed since the breakout of Tiananmen square democracy movement, the history scholars considers the final stages of 10 years on the first China of 21 century in the frame of world economy, and at this time the economy power of China which continues to grow does not help the democracy to bloom in China which is called G2 along with the United States, and the democracy is hidden as a seed under the shade of communist of China which obtains a high score from peoples. In this view, a great advancement of China is expected, which is currently considered as a giant monster in the world. In particular, the Chinese economy did not achieve the G2 as a super power in the world economy with the help of North Korea. In order to keep the stance of G2, the frame structure of Korea economy is absolutely needed, so the negative opinion on the Tiananmen square democracy movement is not considered as an important matter as compared to the past. When the influence of China increases, it seems that the influence with respect to the unification of Koreas and the union of Asian countries might be hard, but behind the super power appearance of China, there are a lot of warnings with respect to the debts in public field of China from locally and abroad. "As the public debts of China increased up to 96% of GDP of China, China causes another problem in the world economy" warned by one renowned economist of the United States. The dangers of the debits of the local governments are considered as being dangerous also, so it seems that the China economy, which is on the verge of recovery, might be a new factor damaging to the world economy.